I’d like to apologize in advance if I may sound like a teenager in this post, but I am super pumped over my spiralizer. Hubs bought it a couple months ago and I’ve just been putting off using it, no reason why, I just didn’t know how much fun it’d be to make these zoodles. 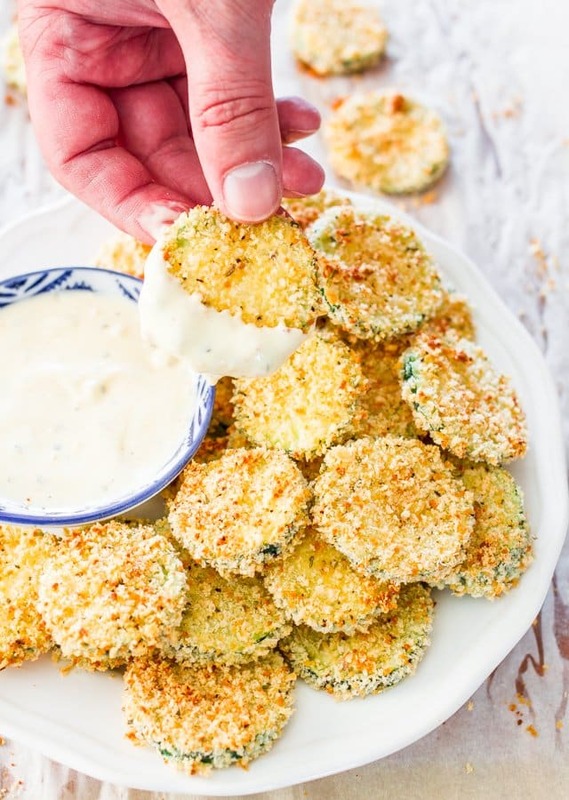 I cannot wait to see what other vegetables I can use instead of zucchini. But for now zucchini it is. Truth be told hubs made a killer zoodles dish before he bought the spiralizer, he used a grater to make the noodles and it took him forever. That’s when he had enough and bought the spiralizer. To use the spiralizer it took me 1 minute, no lie. And it’s so easy, seriously. I used 2 zucchinis here and you end up with a big bowl of zoodles. The bigger your zucchini the longer your zoodles will be and my zoodles were huge. Don’t they look fab? Whoever invented this, total genius. Now for the recipe. I love shrimp scampi, and I have a killer recipe here on my blog which I make often. But as I mentioned before I’ve been doing a low carb diet thingy, and although I finished my 2 weeks I decided to continue on a bit more, because I felt really good during the 2 weeks so why not, it’s good for me. This is why I’m making dishes like this, because they’re super low on carbs but super high on taste. So shrimp scampi, my fav! Took my good ole’ trusted recipe and lightened it up. All you need are precooked shrimp, some tomatoes because I love cherry tomatoes in my shrimp scampi, and usually I use wine in my shrimp scampi, but because I wanted to lighten up this dish a bit more I used chicken broth, plus I cut out the butter. 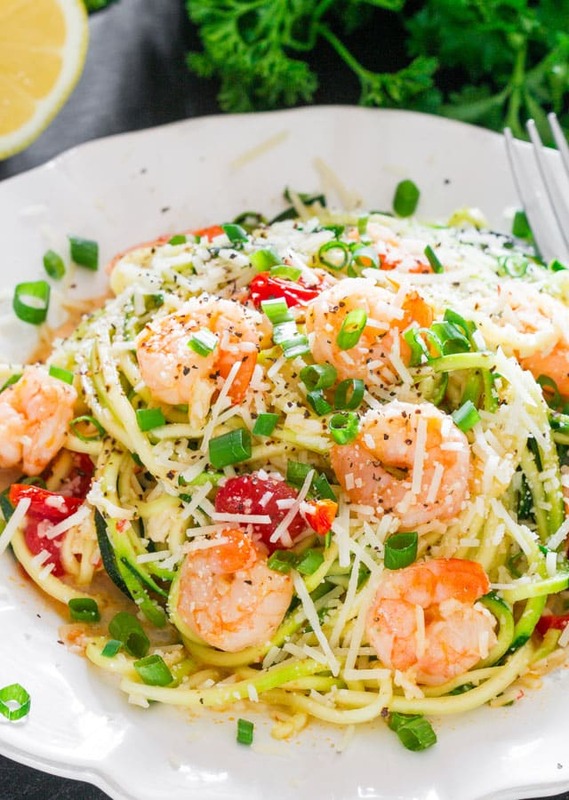 But not to worry, there was plenty of flavor in this zoodles dish. Of course I added some Sriracha to my scampi and some Parm and that’s about it, my friends. You end up with this super colorful and totally flavorful low carb dish that will knock your socks off. You might even be able to fool your kids with these faux noodles into eating their veggies. Even my pup beagle, Mia, loves zoodles and since she’s on a low protein diet, I’m more than happy to give her some plain zoodles. 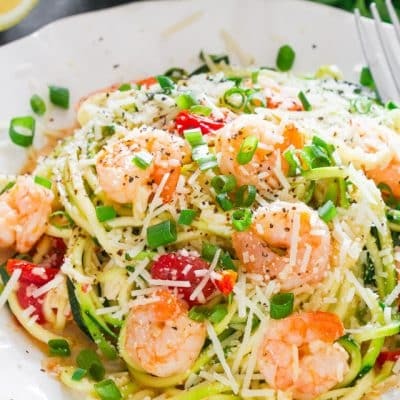 Shrimp Scampi Zoodles - take your favorite shrimp scampi dish and lighten it up with zucchini noodles. Same flavors, same deliciousness, but so much healthier and better for you. 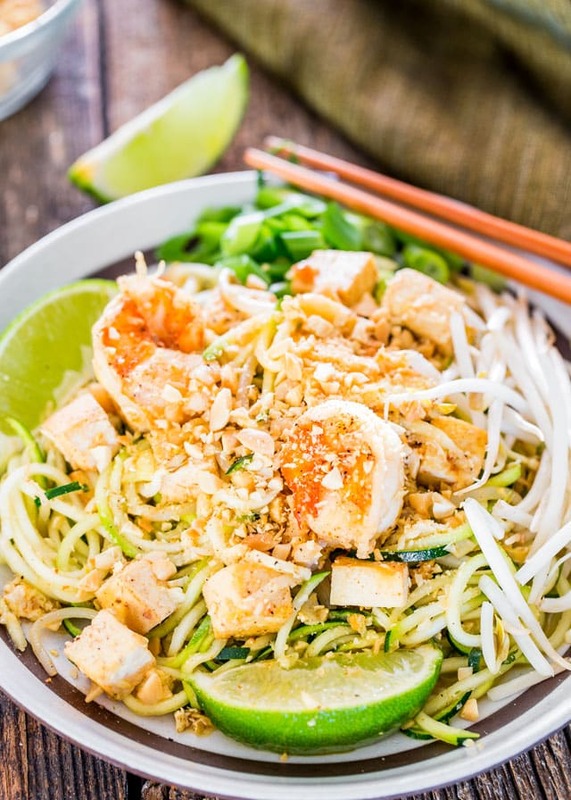 Using a spiralizer or a grater, make the noodle strands. Place in a bowl and set aside. In a large skillet heat the olive oil and cook the onion and garlic until soft. Add hot sauce, chicken broth and juice from half a lemon. Stir then throw in the shrimp and cherry tomatoes. Cook for a couple minutes, not too long because shrimp is already cooked. Season with salt and pepper. Remove from heat.Add zucchini noodles and toss. Top with green onions and Parmesan cheese. Serve while warm. Very tasty but the chicken broth, as has been observed by others. has to be MUCH less. It came out way too soupy. I would suggest that no more than a couple of spoonfuls is plenty. 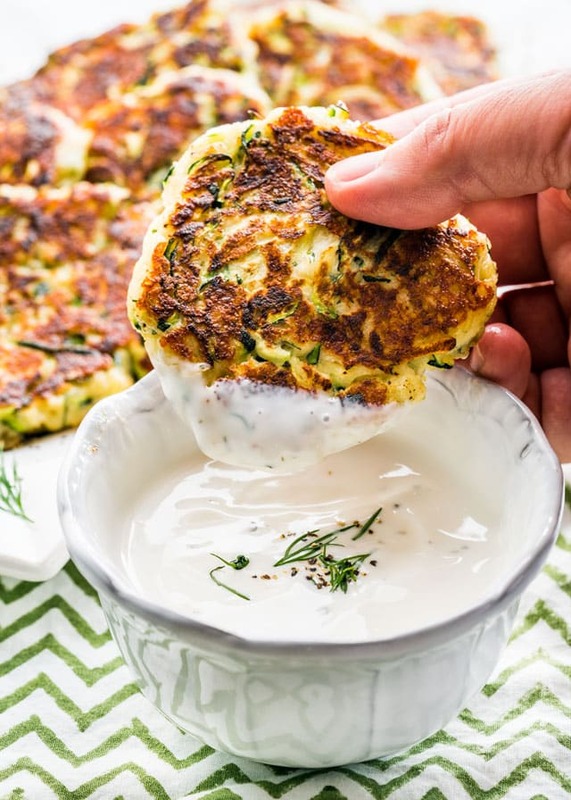 how can I make the zucchini warm, I think I would like the whole dish warm. You can actually add the zucchini noodles in step 2 this will be long enough to heat them up. Being Italian I have been making scampi all my life. I researched this to find out if you need to cook the zucchini first (just got a spiralizer for Xmas, yay!) and have my answer. A little advice for more confident cooks though, never use precooked shrimp. My family is not fond of hot sauce. Can I just drop it or will the dish need something as replacement? You can skip it, I use it to add a bit of spice to the dish, but if you still want it a bit spicy you could use some red pepper flakes instead or cayenne pepper. This whole recipe makes about 4 servings, so 1/4 of it. No you don’t have to cook the zucchini. Ok Jo – I said I was going to make this dish this weekend and I did. Outstanding flavor profile….you rock girl! I did something stupid though. I started spiralizing the zucchini (first time ever using my spiralizer) and thought, man that sure doesn’t look like Jo’s pic. Well, I had not peeled them because I didn’t see that in the recipe. Looked much better after I peeled them lol! And as some of the other reviewers noted, I too decreased the broth to 1/2 c. as the shrimp and zucchini throw off a lot of water. I found the sauce more than sufficient. I also did not halve the tomatoes and used grape tomatoes instead of cherry. Nom nom nom. Awesome awesome! I can’t WAIT to try this recipe! 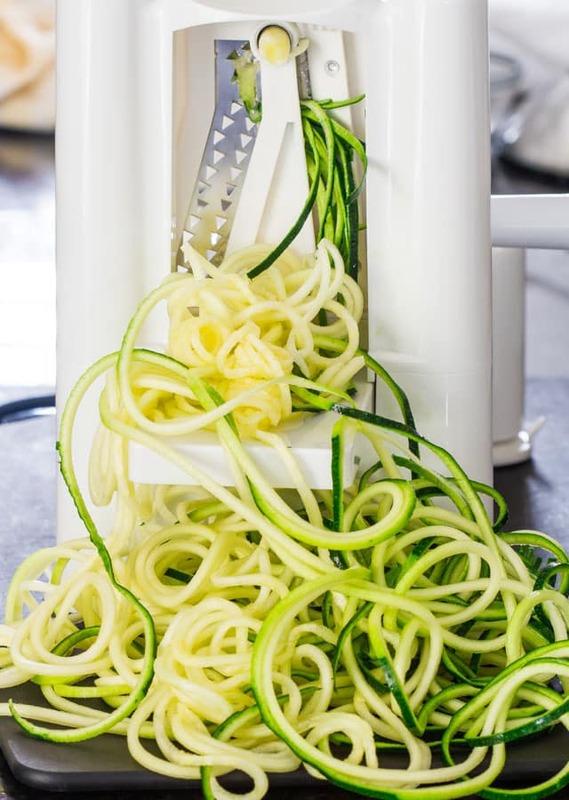 My sis gave me a spiralizer and I’ve been searching for a recipe to try it on – something beyond plain old spaghetti sauce, etc. 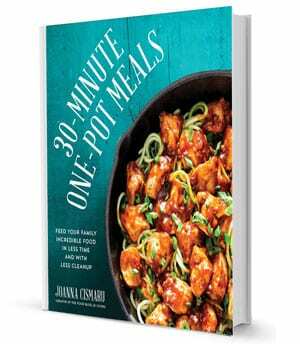 Am going to try it this coming weekend and will let you know how it comes out. Gonna go ahead and rate it 5 stars as everything I’ve tried that you’ve published has been outstanding. Happy New Year, Jo and keep the recipes coming! Awesome! I do not think the amount of broth is needed, but the recipe was perfect otherwise. I think next time I will add a little extra Sriracha too. Thanks for sharing! I can’t believe I used to waste so many calories on spaghetti or angel hair pasta. I know! 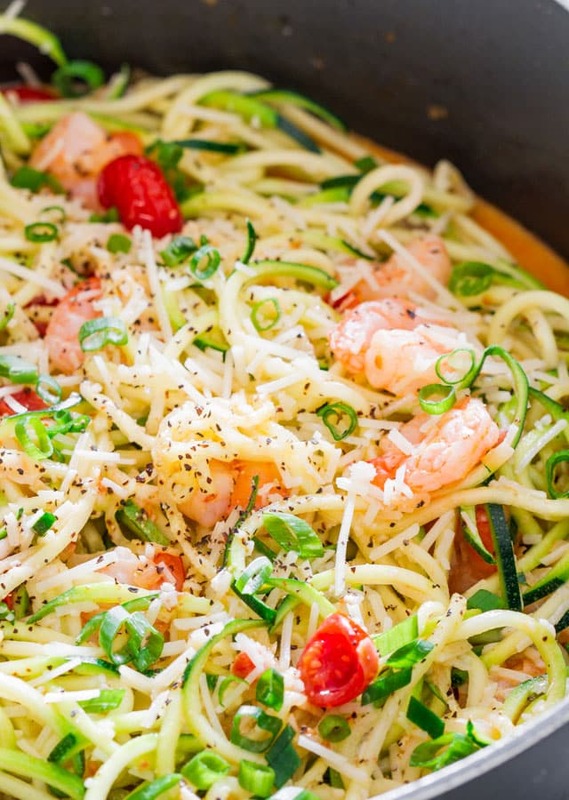 Zucchini noodles are the best, you can pretty much substitute them in any pasta dish and the fact that they don’t really require any cooking is great. This exceeded my expectations! So tasty and flavorful! 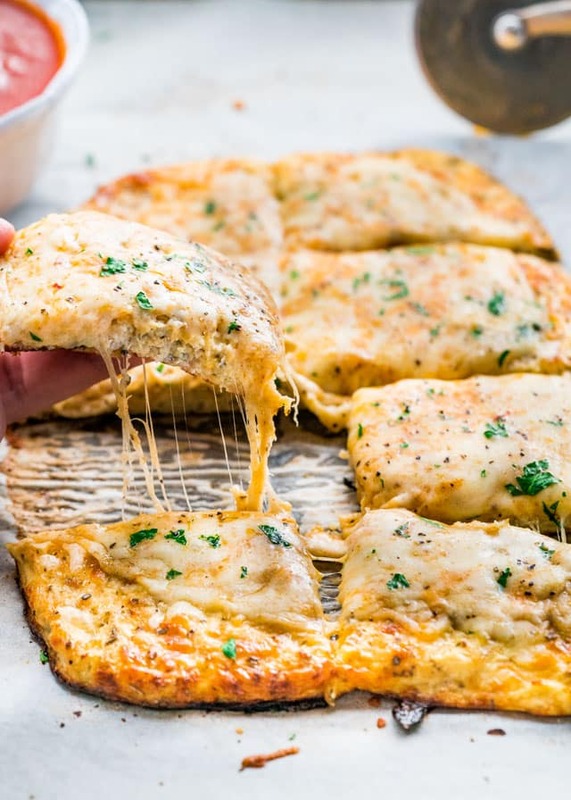 Great tasting recipe that is very quick & easy! I used my wok to make this dish. My only change next time will be to use a little less chicken broth. 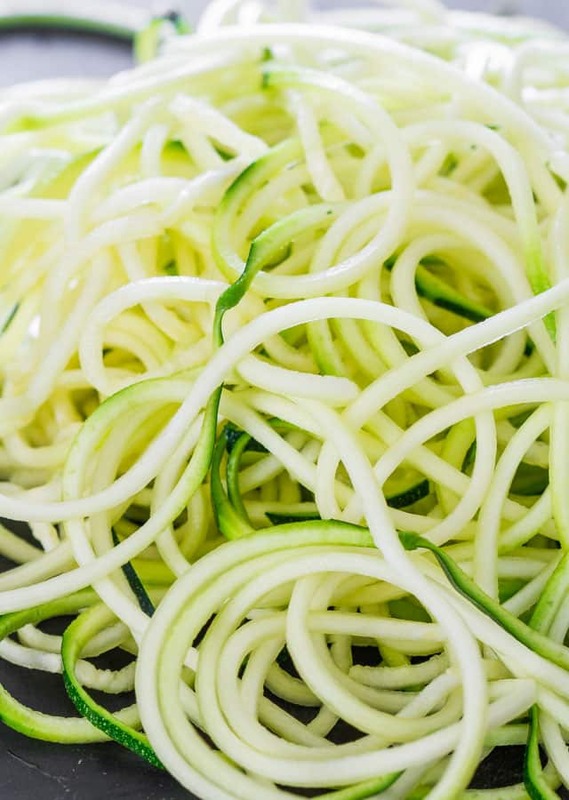 I need to get my spiralizer back out! I’m just waiting for the growing season to start again so I can get zucchini from my CSA. I’ll be adding this to the menu though! Yay! 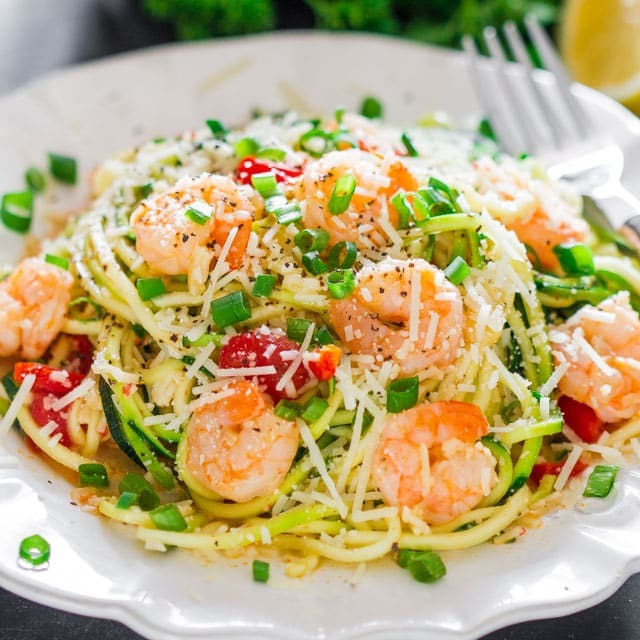 So glad you broke out the spiralizer and made zoodles! This dish looks delish 🙂 I’m on a spiralizing frenzy: sweet potatoes, cucumber, apples… Hubby jokes I’m going to spiralize everything in sight!! I am not familiar with zoodles. 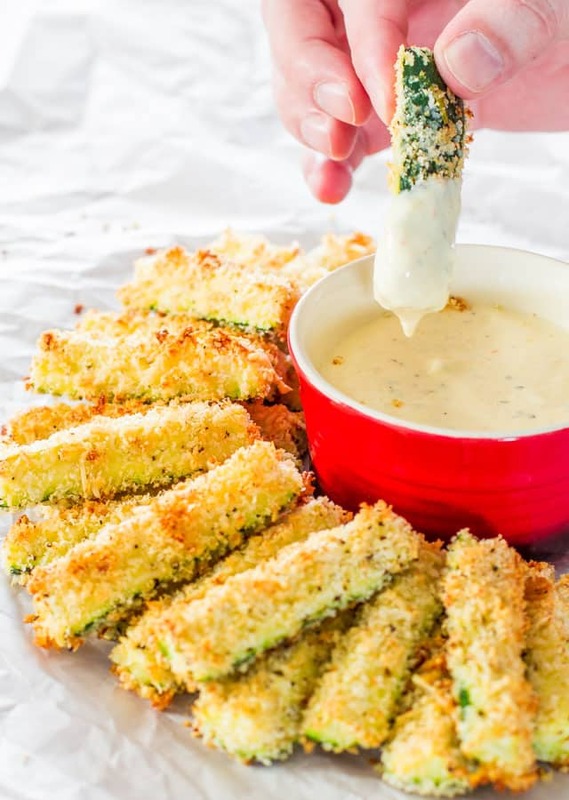 Do you cook the zucchini? I did not see that in the recipe. No you don’t, there’s no need to, all you need to do is add them at the end and toss with the sauce and shrimp. I tried this with fresh prawns recently and cooked the prawns in a little oil and butter and with the zoodles. Not an unhappy face anywhere. I love your easy recipe! with a simple sauce. A low calorie tasty meal. SCORE! Lovely and simple. 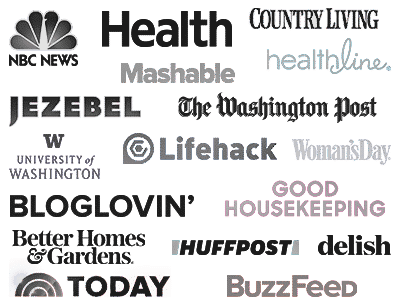 I have a spiralizer and hope you create more recipes using it! I asked for a spiralizer for my birthday, so hopefully that’ll be what I get. Haha. This is such a great take on a delicious meal. Maybe I can even trick my boyfriend into eating zucchini if it’s shaped like a noodle.